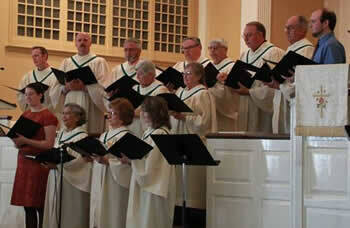 Directed by David Benton, the Temple Choir rehearses Thursdays from 7:30 - 8:30 pm. They sing at the 11 o'clock worship each Sunday. The men in the Temple Choir have been dubbed the Back Row Singers as they offer occasional presentations on Sunday mornings. 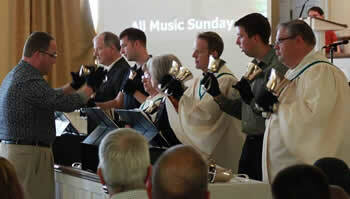 John Rudy directs Brethren Bells, a hand bell choir that rehearses Thursdays from 6:30 - 7 pm. This group performs periodically in Sunday morning worship. The praise band provides music for the Sunday@nine service, a contemporary worship in the Fellowship Hall, each Sunday at 9 am. For more more information about how you can participate in one of these musical groups, contact David Benton.